With the help of IBM researcher Martin Wattenberg, Shirky calculates that the cumulative effort invested in Wikipedia since its inception—“every edit made to every article, and every argument to those edits, for every language that Wikipedia exists in”—totals about 100 million hours of intellectual labor. Compare that to the 200 billion hours Americans spend every year watching television, writes Shirky. That’s about 2,000 Wikipedias’ worth of time expended every year, in one country. Shirky claims that younger generations are transitioning from passive TV-watching to active online engagement, and therefore communal projects like Wikipedia are the wave of the future. His critics have countered that the evidence does not support his description of reality: Surveys indicate that the average amount of time people spend watching television has continued to rise since the arrival of the Internet—so if young people are spending more time online, they are likely spending less time actively engaged in the physical world around them. 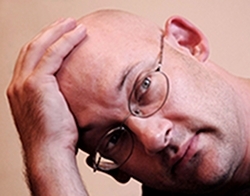 Shirky is currently spending time away from his post as a teacher in the Interactive Telecommunications Program at New York University to serve as a visiting fellow at Harvard University’s Berkman Center for Internet & Society. We met up with him there last week for a brief interview. Open Culture: You’re well known as an optimist when it comes to technology’s effect on society. As a consequence, you’ve drawn a lot of criticism from the other side. Do you ever feel like a lightning rod for Luddites? Clay Shirky: I’ve certainly become a lightning rod, which is relatively recent. I should say also, I’m not an optimist about technology full stop. I am an optimist about democratizing media. For instance, the effects of television seem to me to be far more complicated and far less positive than the effects of the printing press. Even though, or perhaps because, we spend more time watching television than we do with written material. But obviously one of the effects of the printing press was to democratize production, to increase dramatically the number of voices available for public discourse. Television, much less so. So I’m not a techno-optimist full stop. I am an optimist about democratizing media technologies. I have become a lightning rod in a way that I find a little bit disorienting, because I’ll sometimes read about myself and see opinions attributed to me that I haven't actually expressed, but because they were expressed by other optimists we are kind of lumped together. My interpretation of this is that, for a long time the people who believed that this change in the media landscape was good simply weren’t taken seriously. The idea that this was going to lead to any kind of significant restructuring of any aspect of society was just seen as a kind of a fringe sensibility. I think with the collapse of the mainstream newspaper’s business model, there is now an example in which the Web is demonstrably transforming the intellectual and cultural landscape. And so I think that part of the reason for this lightning rod thing for me and for other people—for J.Z. (Jonathan Zittrain), for Yochai Benkler—is that there’s now a broad swath of society who doesn’t think about the effects of technology but nevertheless has come to believe that the web really does mean a restructuring. Some of the lightning rod stuff is essentially that conversation now spreading out to the general population. I think that this phase will probably last a year or two and then we’ll be on to some kind of post-lightning rod conversation. Clay Shirky: I got ten years of work out of the intuition that the Internet was getting more social, but I’m done with that now. I don’t have anybody to fight with anymore. That thesis is sort of broadly agreed to. The piece I’m working on now is specifically around journalism. My current formulation is that markets supply less accountability than democracies demand—that if you leave the presence of accountability to an entirely market-driven press corps, you get less coverage than democracies need to survive. And we’ve had all of these ways in the past of subsidizing that, right? So broadcast news had to be subsidized because the FCC said so when they handed out the licenses, and newspapers subsidized it because they had essentially enjoyed local monopolies but were relatively free of too much interference by advertisers. But a lot of those old subsidies are breaking. So the advertising subsidies that newspapers enjoyed, and the subsidies that were essentially required by the federal government of broadcast outlets, are all going away at the same time, and they’re all going away for the same reason, which is to say, none of those subsidies survive abundance. So the question I’m asking myself is—assuming this hypothesis is right—what are other ways that society can subsidize the kind of journalism that leads to accountability of elites, principally politicians but also business and religious elites? I don’t know the answer to that. There’s a lot of interesting experiments: ProPublica, Spot.us, GroundReport. But that’s the question I’m turning my attention to.